NEW JERSEY – NASA astronaut Scott Kelly captured a rare and spectacular display of ‘thundersnow’ from space as Snowzilla’s blast pummeled much of the US East Coast this weekend with two feet or more of paralyzing snow from the nations’ capital to New York City and beyond. Meanwhile the NASA-NOAA Suomi NPP Earth orbiting satellite almost simultaneously snapped an eerie image of the East Coast bathed in Moonlight as the ‘Blizzard of 2016’ battered over 85 million residents in 20 states across the East Coast. The Suomi NPP satellite image of the massive winter storm system pummeling the eastern United States was taken at 2:15 a.m. EST on Jan. 23 by the Visible Infrared Imaging Radiometer Suite (VIIRS). 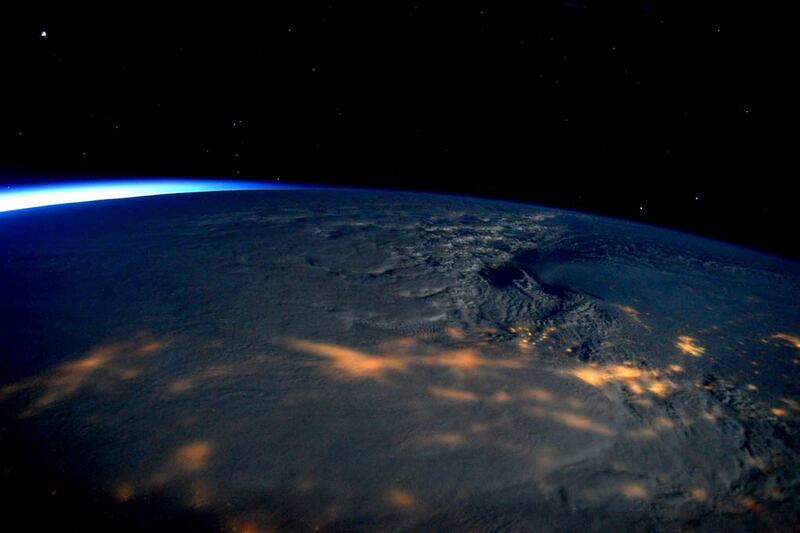 Kelly captured the spectacular ‘thundersnow’ photo on Saturday, Jan. 23, from his perch aboard the International Space Station (ISS) that approached or set snowfall accumulation records in many major metropolitan areas from the mid Atlantic to the Northeast corridor. “Rare #thundersnow visible from @Space_Station in #blizzard2016! #Snowzilla #snowmaggedon2016,” Kelly tweeted with a chance shot on Jan 23, 2016. Because from one moment to the next the “rare thundersnow” vanished from sight – see comparison photos above and below. “Massive #snowstorm blanketing #EastCoast clearly visible from @Space_Station! Stay safe! #blizzard2016,” Kelly tweeted with a photo earlier on Saturday from a similar vantage point. Kelly has just passed Day 300 of his historic “1Year ISS Mission” aboard the outpost and is conducting hundreds of experiments aimed at paving the way for multi-year expeditions to the Red Planet. Record tides caused extensive flooding, beach erosion and property destruction along a wide section of the Jersey shore. Some areas suffered catastrophic destruction even worse than Hurricane Sandy. Many airports were closed and are only slowly reopening, wreaking havoc on the air transport system. More than 13,000 flights have been canceled so far since Friday, Jan. 22. The storm lasted into Sunday, Jan. 24, causing at least 45 deaths. Next PostNext How Long Would It Take To Travel To The Nearest Star?